Synthetic peptide within Human DARPP32 aa 1-100 (N terminal). The exact sequence is proprietary. Rat brain, cerebral cortex and hippocampus tissue; Mouse brain and cerebral cortex tissue; Human breast adenocarcinoma; Human fetal brain tissue lysate; Human colon tissue; pig brain tissue. Our Abpromise guarantee covers the use of ab40801 in the following tested applications. WB 1/1000. Detects a band of approximately 32 kDa (predicted molecular weight: 32 kDa).Can be blocked with DARPP32 peptide (ab189245). For unpurified use at 1/5000 - 1/50 000. For unpurified use at 1/50. Belongs to the protein phosphatase inhibitor 1 family. Dopamine- and cyclic AMP-regulated neuronal phosphoprotein. Phosphorylation of Thr-34 is required for activity. Immunohistochemical analysis of paraffin-embedded human colon sections labelling DARPP32 with purified ab40801 at dilution of 1/50. The secondary antibody used was ab97051; a goat anti-rabbit IgG H&L (HRP) at dilution of 1/500. The sample was counterstained with hematoxylin. Antigen retrieval was performed using EDTA Buffer; pH 9.0. PBS was used instead of the primary antibody as the negative control and is shown in the inset. Immunocytochemistry/Immunofluorescence analysis of mouse brain tissue lysate labelling DARPP32 with purified ab40801 at 1/100 (3.4 μg/mL). Cells were fixed with 4% Paraformaldehyde and permeabilized with 0.2% Triton X-100. Antigen retrieval was performed with Heated citrate solution (10mM citrate PH 6.0 + 0.05% Tween-20). 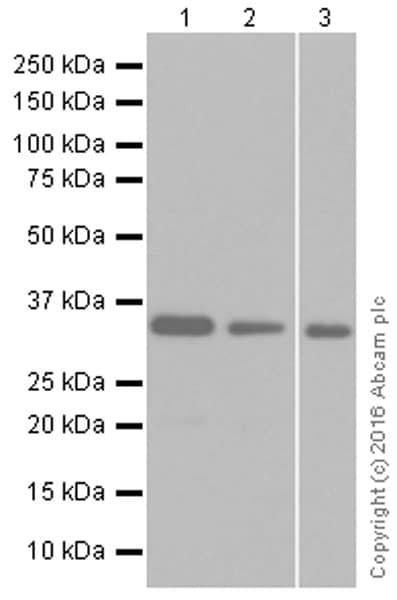 ab150077, Alexa Fluor® 488-conjugated goat anti-rabbit IgG (1/1000, 2 μg/mL) was used as the secondary antibody. Secondary Only Control: PBS was used instead of the primary antibody as the negative control and is shown in the inset. ab40801 at 1/20 immunoprecipitating DARPP32 in rat brain whole cell lysate observed at 32 KDa (lanes 1 and 2). Lane 2 (+): ab40801 + Rat brain whole cell lysate. For western blotting, ab131366 VeriBlot for IP (HRP) was used for detection (1/1000). IHC - Wholemount - Anti-DARPP32 antibody [EP720Y] (ab40801)Image from Tønnesen J et al., PLoS One. 2011 Mar 4;6(3):e17560. Fig 1.; doi:10.1371/journal.pone.0017560; March 4, 2011, PLoS ONE 6(3): e17560. 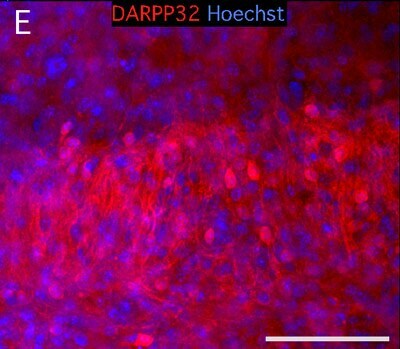 Immunohistochemical analysis of murine brain tissue, staining DARPP32 (red) with unpurified ab40801. Slices were fixed in paraformaldehyde and blocked with 5% horse serum and 0.25% Triton X-100. Samples were incubated with primary antibody (1/200) for 15 hours. ab40801 (unpurified) staining DARPP32 in pig brain tissue sections by IHC-Fr (formaldehyde-fixed Frozen sections). Tissue was fixed with formaldehyde (4%), permeabilized with Triton X-100 and blocked with 0.2% milk for 30 minutes at 24°C. Samples were incubated with primary antibody (1/7500 in TBS + 1% Triton X-100 + 0.2% milk) for 24 hours at 4°C. A Biotin-conjugated Sheep polyclonal to rabbit IgG, dilution 1/400, was used as secondary antibody. Endogenous peroxidase was blocked with 0.3% H2O2 in methanol for 20 minutes. Immunohistochemical analysis of paraffin-embedded Mouse cerebral cortex sections labelling DARPP32 with purified ab40801 at dilution of 1/50. The secondary antibody used was ab97051; a goat anti-rabbit IgG H&L (HRP) at dilution of 1/500. The sample was counterstained with hematoxylin. Antigen retrieval was performed using EDTA Buffer; pH 9.0. PBS was used instead of the primary antibody as the negative control and is shown in the inset. Immunohistochemical analysis of human breast adenocarcinoma sections labelling DARPP32 with unpurified ab40801 at a dilution of 1/50. Immunohistochemical analysis of paraffin-embedded Rat cerebral cortex sections labelling DARPP32 with purified ab40801 at dilution of 1/50. 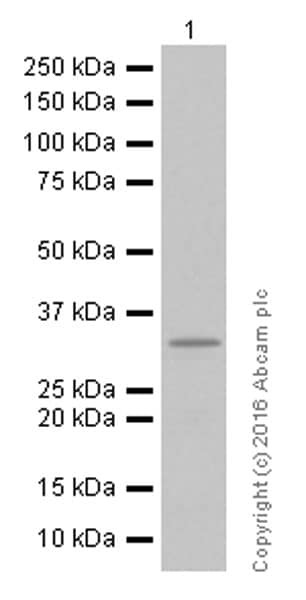 The secondary antibody used was ab97051; a goat anti-rabbit IgG H&L (HRP) at dilution of 1/500. The sample was counterstained with hematoxylin. Antigen retrieval was performed using EDTA Buffer; pH 9.0. PBS was used instead of the primary antibody as the negative control and is shown in the inset. Publishing research using ab40801? Please let us know so that we can cite the reference in this datasheet. While there a many targets which express differentially in distinct layers of the neocortex many of these are expressed in the striatum as well. I found these papers to have a number of good targets which seem specific, such as Pax6 or, for striatal markers, DARPP32, CalB or GAD67. However a search through the Allen Mouse Brain Atlas expression data shows similar gene expression of all these markers in adult striatum and cortex. I would emphasize that this is not vetted data. While any single or combination of these markers may well yield the information which you will be looking for, I feel that the best choices may be to try a few of these targets presented within this literature as you would have reference material to compare with. Further review of our catalog leads me to suggest use of a DARPP32 antibody such as ab40801 alongside use of a Vementin antibody such as ab8978. Alternatively use of PAX6 ab5790 alongside GAD67, ab26116, may yield good results. Each of these pairs will work in double staining as they are comprised of a mouse and a rabbit derived antibody. Further each product has been used in numerous publications and is well characterized by these, Abreviews and scientific support on the datasheet. Each is guaranteed to work in IHC-P as well as a number of other applications and would therefore be covered by our Abpromise guarantee:https://www.abcam.com/abpromise.